Singer 8763 Curvy Computerized Free-Arm Sewing Machine is a very productive sewing machine. It comes with a lot of different kinds of stitch patterns and many automatic features stock. So, you can easily finish all of your favorite sewing machine related tasks with ease. This can be used for heavy duty sewing and quilting too. As it is a heavy machine, you will get an extra advantage while sewing any heavy clothes. And the price of this sewing machine is also within reach. So, it can be a great choice for you. Both adjustable and automatic stitch length and width. Drop and Sew bobbin system. Fully automatic 2, 1-step buttonholes. Stitch can be selected by switch easily. Singer 8763 Curvy Computerized Free-Arm Sewing Machine is undoubtedly a high quality sewing machine. It has a lot of features packed up. And if you compare its price with its features, then you will be amazed. There are so many advantages of this sewing machine. The first and foremost thing to state about this sewing machine is that it is a computerized sewing machine. It can save a lot of your special time with some of its incredible automatic features. And the famous ‘SmartSwift’ threading system of this machine will make threading an easy and pleasant task. There are 30 different built-in stitches on this sewing machine, which will help you to do a variety of sewing. And the price of this sewing machine is also reasonable. As it is a user-friendly sewing machine, it can be a great choice for the beginners and as well as for the professionals. The weight of this sewing machine can be a great plus point for heavy sewing tasks, as this machine will not jump out whether you are sewing a normal cloth or a heavy denim or even quilting. So, if you want a sewing machine with a rigid build quality and of great performance as well then it could be the best choice for you. If you want to acquire the best performance from your sewing machine, then you have to look after your sewing machine. You can follow the tips below. Meanwhile, you don’t use your singer 8763, protect it with any cover to keep it clean. 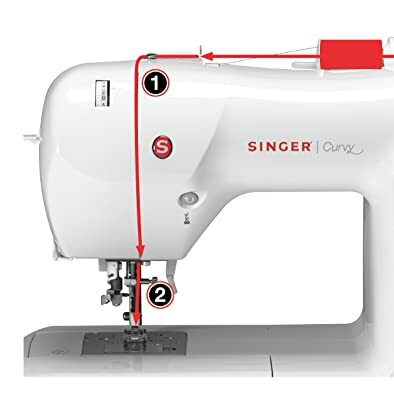 Disconnect your Singer 8763 sewing machine from the electric wall socket after finishing your task. Use relevant stitches for each particular type of clothes. During making any modification to your Singer 8763, always stop the sewing machine. Be aware to never pull threads so hard in the middle of sewing, which can lead to broken needle. Don’t use any broken needle. Do not place or put anything on the openings of your singer 8763. Under no circumstances spray any ignitable chemicals near your sewing machine. Always use the ideal electric socket that has the particular voltage amount. To keep your sewing machine smooth, oil (sewing machine oil) it so that it will not be jammed. Uncover the packaging and bring out the Singer 8763. Take the electric power cord. Connect the plug of the power line cord into the cord socket. And plug-in the other end to the perfect voltage having wall socket. Connect the foot controlled pedal to the machines particular socket and connect the other end to the wall socket. Take the bobbin (15J bobbin). Put the bobbin on the bobbin winder. Now, push it to the left. And wrap the thread around the thread winder. Insert the thread inside one of the bobbin holes. And pull to extend the thread to hold on to the thread. Once the bobbin is filled, cut the thread. Then jump to thread the needle. You can easily do that by using the ‘SmartSwift’ threading technology. Follow the illustration on the machine’s body and with a push of a button you will be finished threading the needle. After that you can adjust the tension of your sewing machine by choice or put it to auto/default settings. Singer 8763 Curvy Computerized Free-Arm Sewing Machine is not an ordinary one instead it is a powerful workhorse. It can be a great choice if you do quilting and heavy sewing. And if you want to get a rock-solid sewing machine which will last long then it could be the next sewing machine of yours. As it is a great performer within an affordable budget, you can definitely go for it.